You've probably seen all of the "do it yourself" picture frame wedding centerpieces online. We've got a better, easier solution. 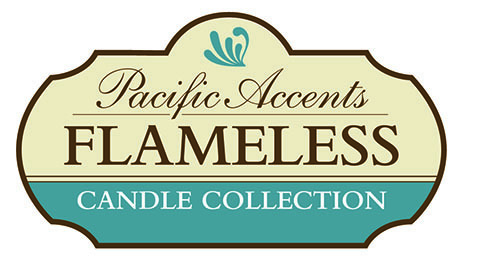 Our Photo-Glo picture frame centerpiece luminary is already assembled and has an integrated flameless candle inside. You also get 3 free images that arrive pre-cut and printed on special paper so all you have to do is slide them in through the top slots of each panel. This is the perfect picture frame wedding centerpiece for the busy bride to be. If you want to change the photos later, simply scan 3 photos or print out digital images on vellum paper (regular paper does not work and looks faded). You can give the centerpieces out as table gifts but be sure to keep a couple for yourself. You can change the pictures for your anniversary each year, the birth of your children, vacations, etc. The possibilities are endless. The flameless candle runs on 2 Alkaline C batteries and gives you up to 900 hours of glow or "on" time. There's even a 4 or 8 hour daily timer on the candle. Want to customize the frame color or texture of your Photo-Glo? Simply slide the clear panels out through the top slots and remove the flameless candle (three screws on the bottom). You can paint the frames to the color or texture of your choosing. Reassemble when you are done. 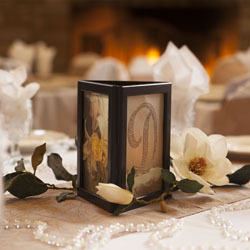 Place your picture frame candle luminary on the table with your assigned seating cards, near your gift box, by your cake and of course as centerpieces on your tables.